Hundreds of BLM protesters marched through the streets of Sacramento on March 30 demanding justice for Stephon Clark, who was shot and killed by Sacramento police on March 18. An independent autopsy commissioned by the Clark family revealed that Stephon Clark had been shot eight times with most of the shots hitting him in the back. Some activists point to what they see as an excessive police response to what started out as a complaint about a car prowler. Two officers searched darkened backyards for several minutes, as a Sheriff's Department helicopter equipped with an infrared camera directed them toward Clark. Some believe the intensity of the response heightened the probability of a violent outcome. Many also point to the barrage of bullets directed toward Clark. The two officers fired 20 rounds in less than five seconds. According to an independent autopsy, eight of those bullets struck Clark, and seven of the wounds were potentially fatal. Those numbers have been highlighted by activists and headlines, but the truth is that they're not unusual. Police officers today are taught to fire an unbroken barrage of bullets until a threat is "neutralized" — meaning the suspect has dropped the weapon or is clearly unable to do harm. "It's not a tennis game where you smack the ball and you say, 'OK, your serve!'" says Mas Ayoob, a police officer and longtime firearms trainer. He says there was an era in which police were taught to shoot a few times, stop, and assess the situation before firing again. But by the 1980s, that method was abandoned as too risky. Lance LoRusso is a former officer and now a lawyer specializing in use of force cases. He says the shift away from "shoot, stop and assess" happened after an increasing number of dash camera videos captured the reality of police shootings. "Bad guys don't react to bullets the way they do in the movies," says LoRusso. "There's videos I can show you where people are shot dead set in the chest and they're still coming at the officer." That's why it's unlikely that police will see their shooting training change back to "shoot, stop and assess." And while high gunshot counts can shock the general public, they're not as big a concern for people who have more experience in pushing for changes in police use of force. Yale Law professor Tracey Meares, who served on President Obama's Task Force on 21st Century Policing, is more focused on the frequency of incidents like Sacramento. "These incidents are still occurring, and the obvious thing to say is that there is still work to do," she says. On the surface, she says it can look as if nothing much has changed — for instance, it's still rare to get a criminal conviction against police officers after a shooting. But Meares says there are signs of change beyond the legal system, in the use of force policies now being adopted by departments. "What we've seen in the last couple of years — training about de-escalation, training about crisis intervention, all of these things — are policies that eventually will have an impact on how courts interpret the reasonableness of the legality of a officer's use of force," Meares says. She points to the recent firing of Officer Blane Salamoni by the Baton Rouge police department. Salamoni is one of two officers involved in the shooting death of Alton Sterling in 2016. Federal and state prosecutors both reviewed the case and declined to press criminal charges, but the department fired him in part because of the aggressive way Salamoni confronted Sterling, cursing and drawing his gun, which may have escalated the situation toward deadly force. Meares believes that as more departments stress the importance of keeping situations calm and avoiding deadly confrontations, it will influence the courts as they determine the reasonableness of police shootings. But that process takes time. At the California state capitol, the ACLU is pushing faster change by rewriting the law itself. This week, the organization partnered with state legislators to introduce a bill to raise the bar for when police can use deadly force. "It shifts our deadly force standard from a reasonable standard to a necessity standard," says the ACLU's legislative advocate, Lizzie Buchen. "An officer may use deadly force only when it is necessary to prevent imminent and serious bodily injury and death." Police are already trained to use deadly force only when necessary, but some think changing the state's standard will create more legal vulnerability for officers who make honest mistakes in the heat of the moment. They say it could lead to dangerous hesitation. "I understand law enforcement officers put their lives at risk, they have to make split-second decisions," Buchen says. But she says the law needs to take more into account the fact that when civilians are approached by police with guns drawn, they also have to make quick decisions. "They might be scared, they might panic. And under current law, an officer can assume they are armed, and kill them if they flinch or move in any way that can be construed as dangerous or reaching for a weapon. It's really disturbing." Buchen and others hope a change in the legal standard would lead police to do more to avoid deadly confrontations; police officers worry they'll be expected to take more chances with their own safety. 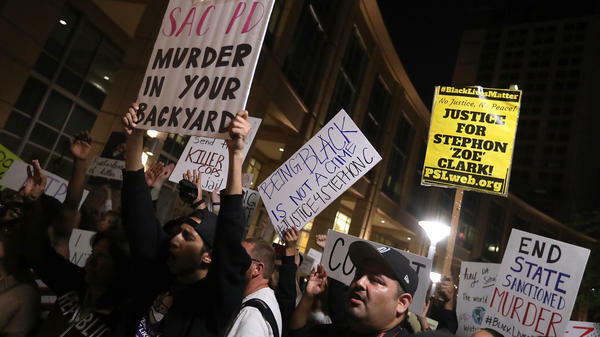 Video of the death of Stephon Clark in Sacramento has rekindled anger over police shootings of unarmed people. Some are asking whether the protests and media attention of the last few years really made any difference in how police use deadly force. NPR's law enforcement correspondent Martin Kaste has been exploring this. And a note - his report includes audio of police officers firing at Clark. MARTIN KASTE, BYLINE: The Sacramento shooting is still being investigated, and it'll be a while before there are any official conclusions about whether the officers acted legally and properly. But the videos from that night are shocking. People keep remarking especially on the number of bullets fired. UNIDENTIFIED PERSON: Show me your hands. Gun. Gun. Gun. (Gunshots). KASTE: Twenty shots by two officers in less than five seconds. Seven of those bullets caused major wounds. That's according to Bennet Omalu, the doctor who did an independent autopsy for Clark's family. BENNET OMALU: Each one of these bullets independently possessed a fatal capacity. All he needed to have died was just one of the seven. KASTE: To the average person, this looks like overkill. But the truth is, this is how cops are taught to shoot. Massad Ayoob is a respected firearms trainer. MASSAD AYOOB: It's not a tennis game where you smack the ball, and you say, OK, your serve. If you have to shoot somebody, you want him down before he shoots you, before he shoots one of the people you swore an oath to protect. KASTE: That means you keep pulling the trigger until the threat is neutralized, to use the common euphemism. Also, cops today often have semi-automatic handguns, which hold more bullets than revolvers did, so when they decide to shoot, more bullets go down range. There was a time when the training was different. Cops used to be taught to shoot, stop and assess. But Lance LoRusso says that method was abandoned in the '80s. He's a former officer, now a lawyer who specializes in the use of force. LANCE LORUSSO: The advent of video showed us that bad guys don't react to bullets the way they do in the movies. There's videos that I can show you where people are shot dead set in the chest, and they're still coming at the officer or going at another party. KASTE: And that's why we're not likely to see a change in the number of bullets that cops fire. But for those people who've been trying to change policing since Ferguson, the number of bullets fired matters less than how often this happens. TRACEY MEARES: These incidents are still occurring, and the obvious thing to say is that there is still work to do. KASTE: Tracey Meares is a Yale law professor who served on President Obama's Task Force on 21st Century Policing, which was formed after Ferguson. She says on the surface, it can look as though nothing much has changed. For instance, it's still rare to get a criminal conviction against police officers after a shooting. But she says you have to look beyond the courtroom and at the new policies being adopted by police departments. MEARES: What we've seen in the last couple of years - training about de-escalation, training about crisis intervention. All of these things are policies that eventually will have an impact on how courts interpret the reasonableness of the legality of police officers' use of force. KASTE: But that kind of change is gradual. Others want to rewrite the laws now. At the state capitol in California, the ACLU's Lizzie Buchen is pushing a bill to raise the bar for when police can use deadly force. LIZZIE BUCHEN: When a civilian is approached by a police officer with a gun drawn, they might be scared. They might panic. And under current law, an officer can assume that they are armed and kill them if they flinch or if they move in any way that could be construed as dangerous or reaching for a weapon. KASTE: The ACLU's bill would reserve deadly force for times when it's, quote, "necessary." Right now, the state allows it when it's reasonable. A tougher standard may mean police will be asked to take more chances with their own lives, but Buchen says it tips the balance toward protecting, as she puts it, all lives. Martin Kaste, NPR News. Transcript provided by NPR, Copyright NPR.